Back in the Fifties it was unusual for comics to carry advertising (if you ignore those tiny classified ads selling cheap stamps to collectors). So Eagle’s proprietors were a tad embarrassed at the four pages of display advertising they sold. In an attempt to make it more acceptable they suggested advertisers use strip cartoons. There were two incentives; they charged less for the space, and offered the services of an Eagle artist to help draw the ad. 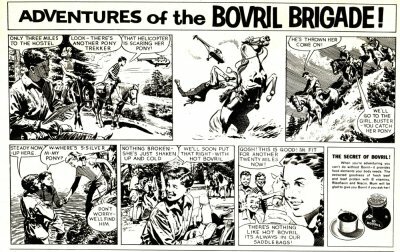 Most of the Bovril half-pages, which began in 1963 and ran into ‘64, were drawn by Richard Jennings. Frank drew only these two (maybe commissioned when Jennings was on holiday). 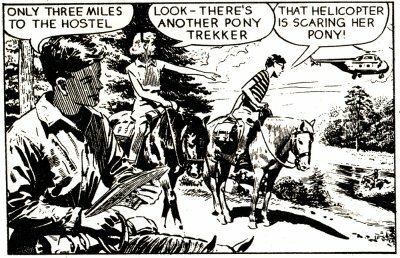 They appeared in comics besides Eagle; such as TV Comic 14/12/64 and Princess 02/03/63 (second ad appears on page 16). 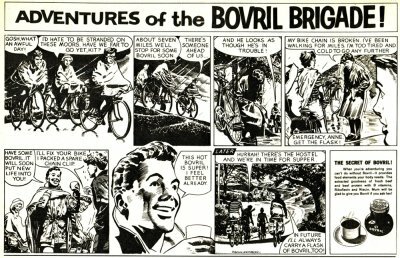 The name Bovril, like many early 20th century brand names, is derived partly from Latin. Bos means ox. A popular novel of the time featured a 'an electric fluid' which 'cured diseases and established the equilibrium of natural powers.' The drink was called Vril. Bovril today is owned by Unilever, and is no longer made from beef extract, but from yeast.